Come see what it's all about and celebrate a day of giving and hear about our 2019-20 season! No pre-sale tickets or Reservations needed! On this community day of giving (over 1.5 million given to our San Angelo community in 2018) come share in the celebration at Be Theatre! 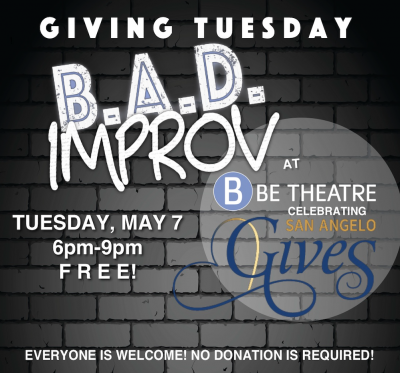 No donations are required, but we will follwing the progress and giving our patrons a look at what Be Theatre is all about! Plus, be the first to hear our 2019-20 season! No Pre-sale tickets or reservatinos needed! BYOB! Personal Coolers that fit under your chair only. No glass bottles except wine bottles. Snacks bar open with non-alcoholic beverages, ice, and candy by donation. Once a month improvisation shows that involve actors from all over the community. We're slightly above average-ish, hard working "actors" and alot of folks say we're pretty funny. B.A.D. stands for "Be After Dark." But we also like that it covers us if you don't think we're any good. Either way, you've been schooled on our name. Ages 16 and up only. HIRE OUR TEAM FOR YOUR NEXT EVENT! Click here to read more about hiring us to make your next private or corperate event super intersteting and cool. Personal size containers/fabric portable coolers that fit under your chair are permitted. Large coolers will NOT be accepted into our space. We will ask you to take it back out to your car. Please do not bring glass liquor or beer bottles into the theatre. We will have 'by donation' non alcoholic beverages at our bar. We reserve the right to ask you to leave and call you an cab/uber if we feel you are not drinking responsibly. We will have security and we will do it!